www.archives.gov.ua — site of the State Committee on Archives of Ukraine, it contains the information about publication of two volumes of I.S. Mazepa’s decrees. www.britannica.com — site contains the biography of І. S. Mazepa in English. www.cossаckdom.com — specialized site which contains the documents, maps, illustrations , scientific publications dedicated to the history of Ukrainian Cossacks of XV–XХI centuries. www.encyclopedia.com — site contains the biography of І. S. Mazepa. www.encyclopediaofukraine.com — site contains the biography of І. S. Mazepa. www.exlibris.jrg.ua — it publishes the work of О. Apanovych “Great idea of the hetman Ivan Mazepa”. www.highbeam.com — site contains several biographies of І. S. Mazepa in English. www.history.com.ua — Ukrainian historical portal. It contains quite a lot of information about І. Mazepa and the events with regard to his person. www.history.org.ua — site of the Institute of History of Ukraine, National Academy of Sciences of Ukraine, which contains PDF-version of the Ukrainian historical journal with publications dedicated to І. Mazepa and his times. www.mazepa.in.ua — site of the Hetman Mazepa scientific and research centre of Cossacks. www.izbornyk.org.ua — site contains the work of Т. Mats’kiv “Hetman Ivan Mazepa in the Western European sources of 1687–1709″. www.kozatstvo.org.ua — site of the All-Ukrainian public organization “Ukrainian register Cossacks”. The site contains the article of М. Mazepa “Church policy of the hetman Mazepa”. 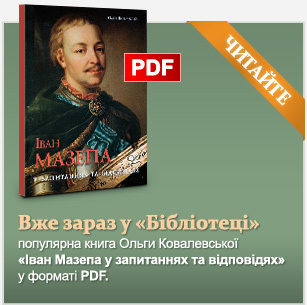 www.lib.if.ua/publish2009/1242202668.html — contains the index of the book fair dedicate d to І. Mazepa: Ivan Mazepa – glorious hetman of Ukraine: index of the book fair to 370-years anniversary from the date of birth. [Electronic source]. www.libr.rv.ua — site of the Rivne state regional library which contains one of the indexes of literature dedicated to І. Mazepa. www.litakcent.com — site of the modern literature. It contains reviews of the modern publications, including also those dedicated to І. Mazepa. www.litopys.org.ua — site contains an electronic copy of the second edition of monograph by О. Ohloblyn “Hetman Ivan Mazepa and his age”, 2001.
www.mazepa.do.am — virtual museum of the Hetman Ivan Mazepa. www.mazepa-fest.org.ua — official site of the annual ethnic and rock festival “Mazepa-fest”. It contains the information about festival, as well as the separate section dedicated to the biography of the hetman, museum pieces of Mazepa period, situation about erection of І. Mazepa monument in Poltava. www.museum-ukraine.org.ua — site of the journal “Museums of Ukraine”. It contains a lot of information about rare Mazepa antiques. www.myslenedrevo.com.ua — site contains the bibliography of the works dedicated to the history of Ukraine in XVII–XVIII centuries. www.nbb.com.ua — site of the Public movement “Don’t be indifferent!”. It contains the information about action “Mazepa. Made in Ukraine” and the contest of children works “Who is Ivan Mazepa for me”. www.probertencyclopedia.com — site contains the biography of І. S. Mazepa. www.spilka.us.org.ua — site contains an electronic copy of Т. Mats’kiv article “Hetman Ivan Mazepa — Prince of the Holy Roman Empire”. www.uk.wikipedia.org — Wikipedia, the free encyclopaedia, contains an extended biography of І. S. Mazepa. www.uk–ua.facebook.com — site contains the text of petition by the general public against sabotage by A. Matkovs’kyi, Poltava mayor, of erection of the monument to the hetman І. Mazepa. www.ukrop.com — site contains the biography of І. S. Mazepa. www.visionary.managment.com.ua — site contains the biography of І. S. Mazepa.